I have been biking the roads of Touraine for over 25 years. Until 2009, those rides occurred on our family summer vacations, when I explored the valleys of the Loire, the Cher, the Indre, and the Vienne. Josette and I retired to Tours in July, 2009. I then began exploring Touraine on my bike twelve months a year. I never tire of discovering new villages and landscapes. As a boy growing up in a suburban town in New Jersey, I associated my bicycle with freedom and independence. In first grade I began biking to school. I had an accident coming home one day, ended up briefly in hospital, and the school banned bikes for first graders. By the age of eight I was biking all over town. Even today the feeling of the wind in my face, and the freedom to go anywhere my legs will take me, bring back wonderful memories of biking the streets of my childhood home town. I even find myself humming 1950’s songs, beginning with Jerry Lee, Elvis, and Chuck Berry. Biking gives me an emotional high. I imagine I experience something like the exhilaration that Joni Mitchell describes, speaking of her lover in A Strange Boy: “We got high on travel.” Well, I get high on bike travel, and in the descriptions of my bike trips on this blog I will seek to convey something of that feeling to my readers. Every year in May two groups come from The University of Western Ontario in Canada to ride through the Loire Valley with me. In the first half of May a group of Western students, numbering 30 to 40 and largely from the Department of Kinesiology, arrive in Tours, led by Professor Al Salmoni. Our first trip was in 2007, and on the first day of biking Al and I caught our breath on the bridge over the Cher River at Savonnières. 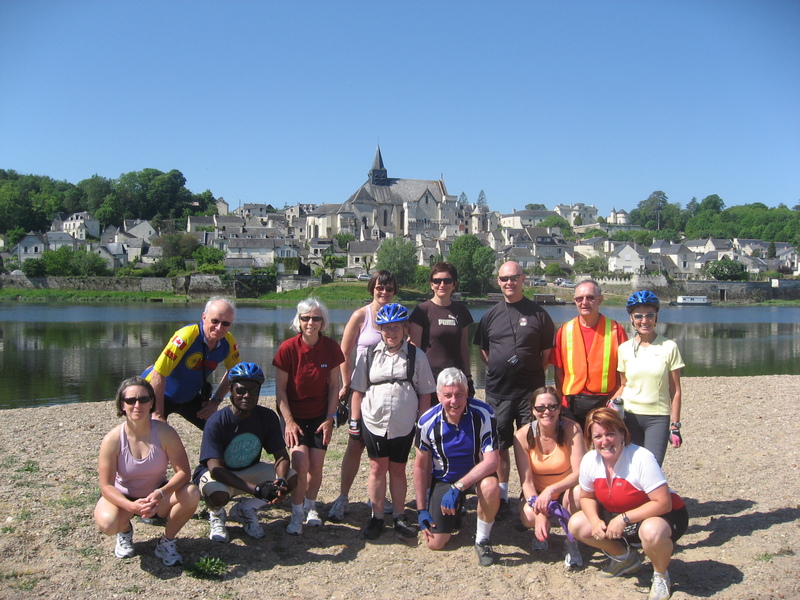 In 2010 the alumni group biked on the west side of Tours and went out on the spit of sand which separates the Loire and the Vienne rivers at their confluence. Looking south across the Vienne is a wonderful view of the church and town of Candes-St-Martin, where the great bishop Saint Martin of Tours died in 397. Most of the routes on the blog are between 50 and 70 kilometers (km) round trip in length. A long ride is 100 km. Even at 50 km, I find I can not get all the descriptive text I want into a single blog of reasonable length. So the bike routes are generally split between two blogs. 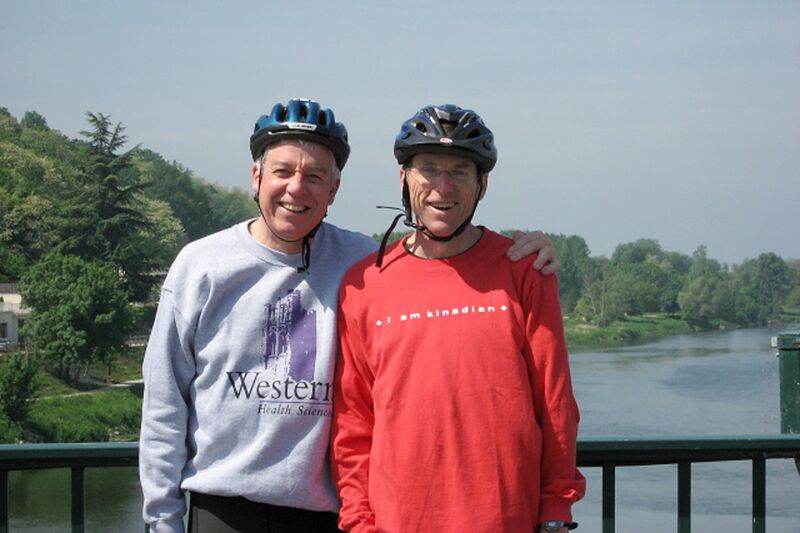 For example, in the first two blogs we bike from Tours to Amboise. The first blog, Chenin Grapes, takes us from Tours to Montlouis-sur-Loire; the second blog, The Amboise Conspiracy, takes us from Montlouis to Amboise. Each of our bike blogs includes a link to a Google Map. Using the zoom feature in Google Maps you can view the individual streets we travel as well as the big picture of our route. You control the amount of detail you want to see. If you get to Touraine, you can replicate our trips almost exactly. Google maps does not yet provide bicycle routes for France, and the car routes rule out city streets and rural paved trails where bikes are allowed but cars are not, so I use the walking mode in Google maps. As a result, in the Google maps on this blog, the distance in kilometers is accurate, but the time required is much too long. The time is calculated by Google at around 5 km per hour walking, while biking for our groups is generally about 18 – 20 km per hour average. Readers interested in the times required for specific bike routes will need to make the appropriate adjustments. Some paved bike routes are not shown in Google, so some of the maps will require an adjustment on the ground; overall, the Google maps provide an excellent guide to our bike routes. On all the bike trips from Tours on this blog, we leave from the train station (la gare de Tours) in the center of the city. The Google maps allow for markers. The blue markers show progress along our route. The red markers show places of interest no on the actual route. To identify a marker, click on it and read the title; only the title is available, because Google Map Maker is not available in Europe (go figure). A km is about .62 miles, or roughly .6 miles. To change km to miles multiply by 6 and then divide by 10. So 20 km = about 20×6/10 = 120/10 = about 12 miles. On each bike route I indicate rest stops with clean bathrooms. If a 30 km route has three suggested rest stops, some bikers will need none of them to reach the destination, and some might need all three. I provide more rest stops than I would use myself, just in case. I also provide a phone number for cafes and other establishments which serve as rest stops, so that you can phone ahead to determine open hours, or seek directions if you get lost. The photo below shows our 2008 student trip at a particularly attractive rest stop: we are at a crossroads in the Chinon wine district just 200 m from the Angelliaume vineyard, where we tasted their superb red wine. I hope I didn’t Click “unfollow” by accident on WordPress page. ( somewhat confusing site …for me anyway) I wish to follow your blog and I would like to know if your tours are available for anyone or are they connected solely to the groups mentioned on your site. 1. Bike tours for students during the first half of May each year, open only to Western students. 2. Bike tours for alumni and friends during the second half of May each year. If space is available, eligibility for those who are not Western alumni is determined Susan Henderson, who manages the Travel the World program at Alumni Western, susan.henderson@uwo.ca. 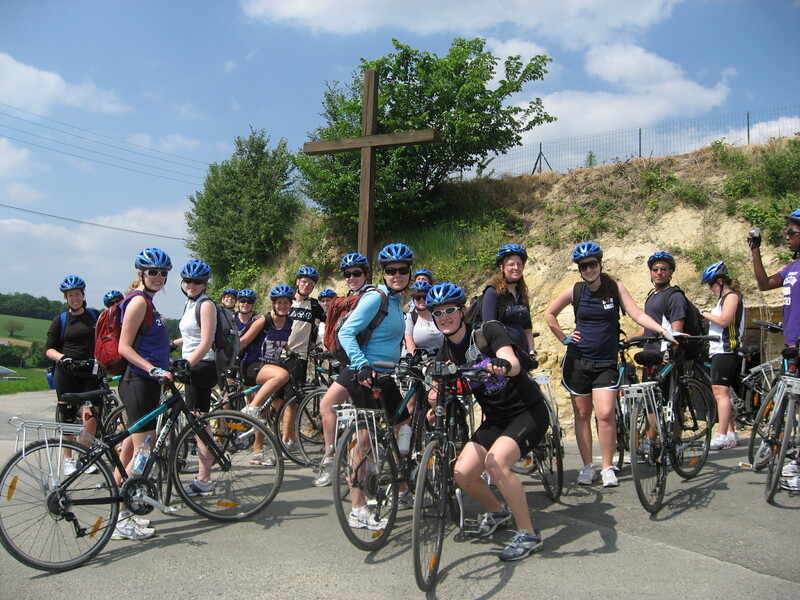 This year’s tour is May 15 to 27 and is described on the Alumni Western website at http://www.alumni.uwo.ca/learn/travel/2012-trips/cycling-in-the-loire-valley-1.html. 3. Walking tours for alumni and friends in Paris and the suburbs, where “alumni” include those who have taken my courses in London, Ontario and Toronto, “In the Footsteps of the Impressionists.” If space is available, eligibility for those who are not Western alumni or former students in my courses is determined by Carolyn Young, Director of Western Continuing Studies, Carolyn Young at ccyoung@uwo.ca. This year’s tour is June 4-16, described on the Continuing Studies website at https://rabbit.vm.its.uwo.ca/WCCS/default.aspx?type=showCourseFrameset&courseID=9095. If you are interested in tours 2 and 3, please contact the offices shown. We have had people on these trips who were not previously connected with Western University and it worked very well. Please let me know if I can be of further assistance. To be clear, I lead these tours as a volunteer, so I have no financial interest in them–for me it is a labor of love!